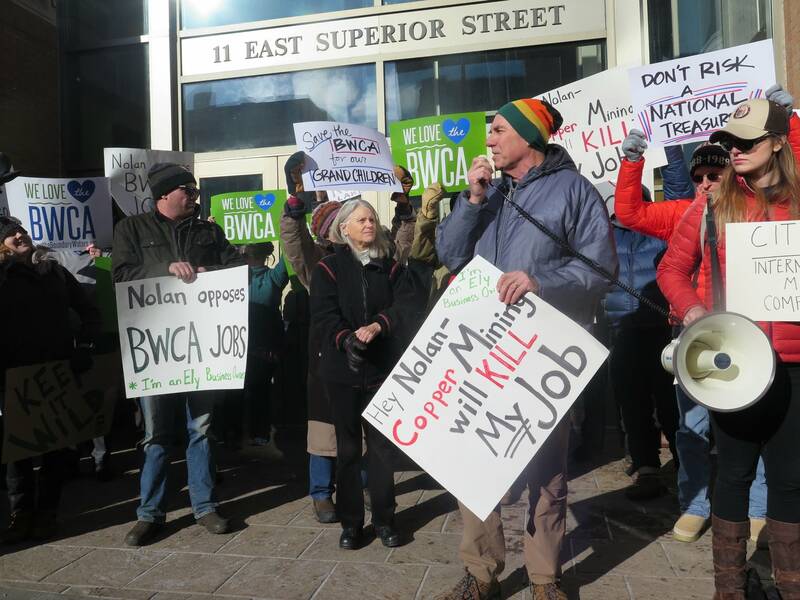 More than 50 protesters rallied outside the Duluth office of U.S. Rep. Rick Nolan Thursday, condemning the Democratic congressman's letter earlier this week calling on the Trump administration to overturn a decision that called for a potential 20-year ban on mining on national forest land within the watershed of the Boundary Waters Canoe Area Wilderness. If the administration follows through on Nolan's request, it could rekindle the efforts of Twin Metals Minnesota to develop a massive underground copper-nickel mine near Ely and the southern edge of the Boundary Waters. The project offers the tantalizing prospect of hundreds of good-paying jobs in a region of the state hard hit by a downturn in the iron mining industry recently. But opponents argue potential water pollution, and the creation of a mining district in the national forest, threatens Ely's tourism-based economy. "Copper kills jobs," Steve Piragis, owner of Piragis Northwoods Company in Ely, told the crowd in Duluth. "In Ely, we have hundreds of people who are employed in the business of fresh water, clean water, that brings people to us." In December, the Department of the Interior under former President Obama put a two-year timeout on mineral development over 234,000 acres of Superior National Forest land that lies within the watershed of the Boundary Waters. The government also called for a 20-year mineral withdrawal — essentially a moratorium on new mining projects — within the watershed and launched a two-year environmental study of that proposed moratorium. "We need the study to go forward," said Becky Rom, national chair of the Campaign to Save the Boundary Waters. "The people need to know. Agencies need to know what the risk of sulfide ore mining is in the watershed. There is no technology known to man that removes that risk." In a letter to the demonstrators, Nolan wrote that he supported responsible mining and a thorough environmental review process. But he argued an environmental review of mining in the watershed should wait until a specific mining plan is submitted. That's the process that has played out for the proposed PolyMet copper-nickel mine, which is located about 20 miles south of Twin Metals, within a watershed that flows into Lake Superior, rather than the Boundary Waters. "Denying any business activity before you know what it is — and what kind of pollution abatement technology they will use or how effective it will be — lacks common sense," Nolan wrote. Nolan wrote that reviewing and potentially reversing the Obama administration's decisions is consistent with the Trump administration's order to freeze and review new government regulations. But his letter was sharply criticized by 4th District Rep. Betty McCollum, whose district includes St. Paul. The fellow Democrat said the Obama administration's decision "was a victory for every Minnesotan who cares about preserving clean water, clean air, and pristine wild lands." That split highlights a longstanding tension in the Democratic party that has been exacerbated by the debate over mining in recent years. During Nolan's first stint in Congress in the 1970s, he was one of the original co-sponsors of legislation that expanded the Boundary Waters wilderness area, and banned the use of snowmobiles and motors in most lakes. He said he's received consistently high marks from environmental groups. But he also represents a part of the state with a rich iron mining heritage and strong support for new mining proposals. "This federal government action threatens our way of life and the jobs that come from this industry," said Frank Ongaro with Mining Minnesota. He said his industry group is asking the Trump administration to look at all possibilities to overturn the decisions. Also at issue is the fate of Twin Metals' mineral leases in the Superior National Forest. In December, the Obama administration refused to renew those leases, which the company has said are critical to its project. Nolan's letter does not mention the leases. But Twin Metals has sued the government over that decision. That lawsuit is still pending. Correction (Feb. 3, 2017): An earlier version of this story misstated what the legislation expanding the Boundary Waters wilderness area accomplished.